One last project that I have taken part in these final two weeks of my internship is another experiment that is taking place in cooperation with the sorghum breeding program at A&M. 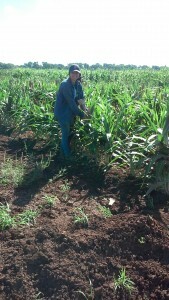 This project is mostly being led by Blake and Dr. Rooney who is the sorghum breeder here at A&M. The project consists of using ESM which stands for Ethyl methanesulfonate which is a mutagen that allows for genetic mutations to occur at faster rates. The object of this project is to eventually create a line of herbicide resistant sorghum that can later be sent to market. The two herbicides which we are selecting for resistance are Laudis and Prowl. 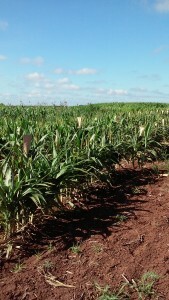 There are two plots, each with 1000 different genetic lines of sorghum and a crossing block where the males and females will be crossed to their respective counterparts. The offspring of this generation will then be grown out and seed will be collected from them to send to a winter nursery in Puerto Rico where further research is going to be performed in coordination with A&M. The purpose of having an herbicide resistant sorghum is to be able to have a crop that will not be damaged when the herbicide is sprayed on it. By creating a resistant line, farmers will be able to spray the two herbicides to control for weeds and will not have to worry about hurting their sorghum crop. 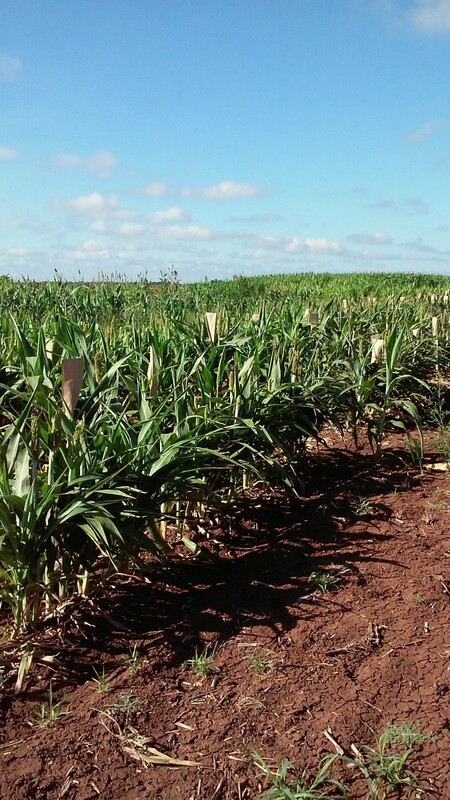 When working on this experiment, I learned how to look for male sterile sorghum plants and I was introduced to the principles of scouting for signs of resistance. These resistant/tolerant characteristics include yellowing of the plants or changes in morphology such as twisting and or curling of the leaves. One of the most important things that I acknowledged when working with genetics is the importance of organization. It can be very easy to get mixed up or confused, but organization prevents errors. Additionally, it is important to double and triple check your work, because a single mistake can damage years and years of work and data. This field is particularly tedious and demands much discipline, but it is also one of the areas that is central to the evolution of agricultural technology. Year after year at field days and conferences, farmers are constantly asking about new lines of crops being developed, and this is because it is so important to keep evolving in sight of environmental change and pest pressures. After working for the weed science lab at A&M after these ten summer weeks, I have realized that there are so many sectors in agriculture that need research. The ultimate goal being to facilitate the lives of farmers who are feeding our country and the world. Through the cooperation of farmers and scientists, we can farm our lands in an environmentally sound manner, so that generations after ours can follow in our steps and farm the lands that we once farmed. This is the system created made out of materials that we had in the greenhouse. It allowed the process of soil washing to go much faster given the large samples. Some of the most important things that I have learned during this internship with Texas A&M have not taken place in a lecture room or in a conference area. The most practical of knowledge comes out in the field when performing simple mundane tasks. There is a variety of knowledge that comes when having to perform tasks such as spraying herbicide in a field, collecting soil samples, or setting up an irrigation system. While working on the different projects I was able to learn how to use things like a backpack sprayer and learn how to adjust pressure as well as to read label recommendations for chemical application rates. Depending on the size of the field the back pack sprayer may be enough to complete an application job. In larger commercial fields tractor sprayers are usually used. I learned the importance of always following safety procedures and following the label recommendations, as failing to do so could lead to safety hazards. 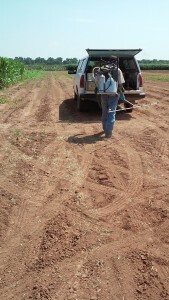 This is one of my co-workers about to use the back pack sprayer to treat a field of experimental corn. Water conservation in the state of Texas is an important issue and area of concern. Water is the single most important element on our planet and is consumed widely in agricultural practices particularly in rice fields like the one that I work on with Tabby. There have been many projects that work with finding ways to reduce the amount of water that is used in Southern rice production, but yield output effects is the main concern. 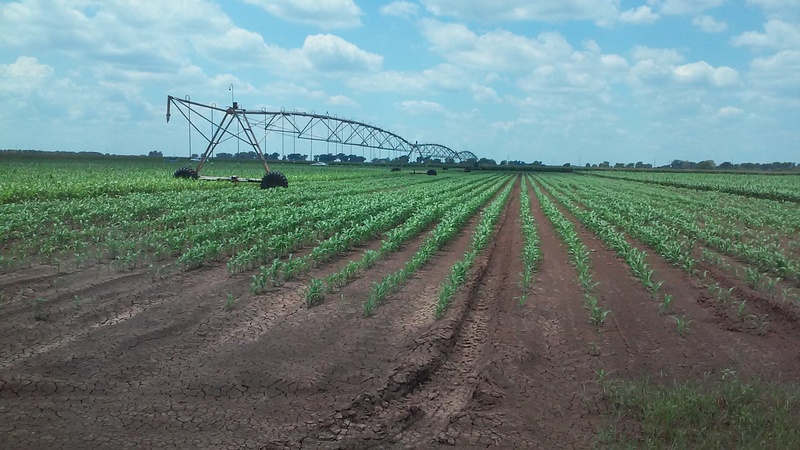 Other crops such as sorghum also make use of flood irrigation systems, which is how we watered Blake’s sorghum and johnsongrass field. 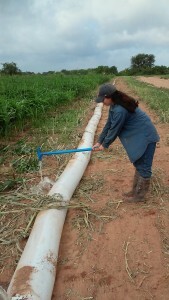 One of the most simple ways to flood irrigate a field is through the use of poly pipe which is a plastic in the form of a long tube mimicking an irrigation pipe. This plastic is tied to the water head which will be the source of water, and can be tied with zip ties but must be tested to watch that the zip ties are strong enough to hold the plastic given a certain pressure. Although we used poly pipe in our research plots, larger operations tend to use either a linear or central pivot irrigation system. These irrigation systems require less human labor and can be programmed. Although water is becoming increasingly scarce, it is a necessary resource particularly in agriculture. Depending on the crop and the region, the water requirements will vary. In addition to this, realizing how much time it actually takes to set up an irrigation system and how much human labor it requires is also important. These tasks are not simple and require the time and effort of multiple people. 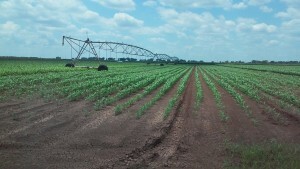 This is a Linear Irrigation System used in commercial agriculture. Finally, one of the most valuable things that I have learned so far is the importance of being able to improvise. All too often, we plan things a certain way and once we get to doing them we figure out that our original plan did not work. 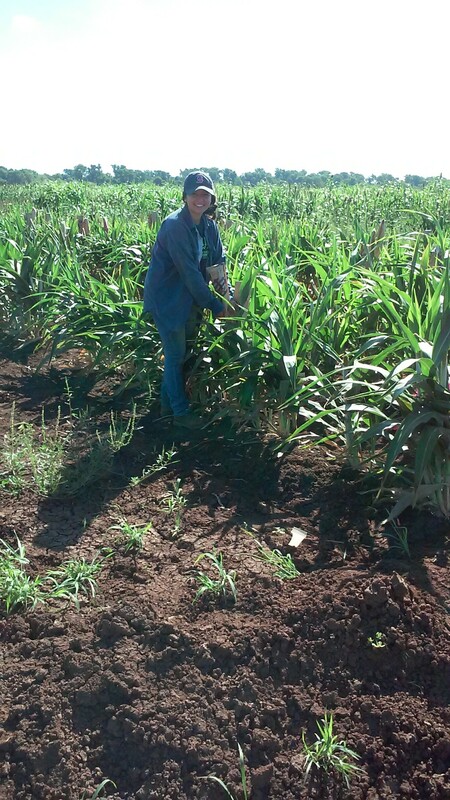 When collecting soil samples from Blake’s sorghum field we found ourselves changing the method of sample collection that was originally planned. We had to make use of plastic buckets and large bags in order to be able to collect representative samples from each of the plots. Once we collected the samples from all 24 plots, we then proceeded to the next step which involved washing the soil and collecting the seed material from each sample to analyze the population of Johnsongrass seed in each given plot. 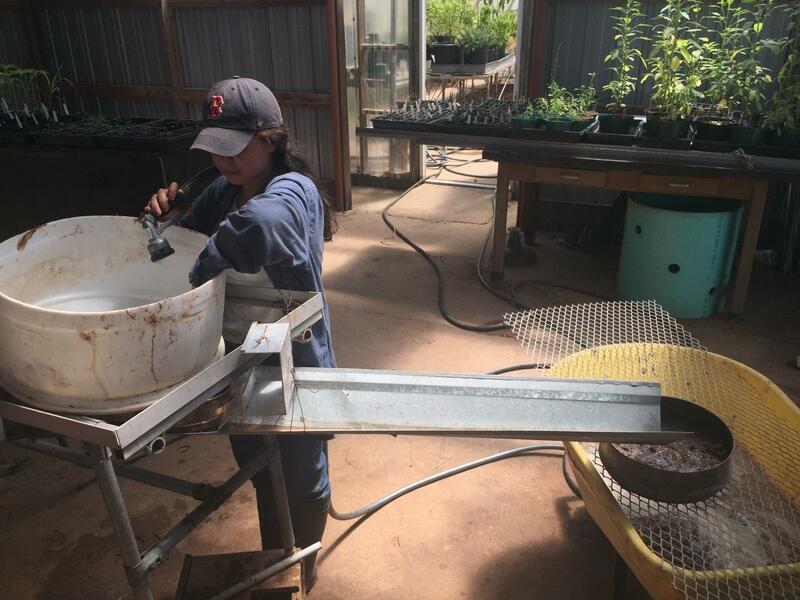 Due to the large size of each sample, we had to devise a way to make the process of washing the soil as time effective as possible. Blake created a system out of materials that we had in the greenhouse to make the process much faster, and it worked! It took time to think about a way to make things work faster, but in the end the process was able to save a significant amount of time (picture below to show the device created). It was these simple and mundane days when I seemed to learn the most, just by watching and then trying things out for myself. I have realized that I can learn things ten times as well if I can do it using my hands, and for this reason I am very grateful to have had the opportunity to work with research programs like the weed science program at Texas A&M. My internship is almost over and there are only a couple of blogs left to wrap up my summer experience. During the next blog I will be sharing my experience with a genetics crossing block that was unlike anything I have ever worked on before! 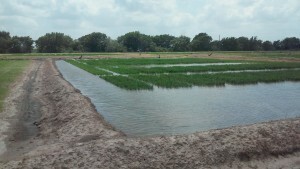 This is a rice research plot presented at the Eagle Lake Rice Field Day in Eagle Lake, Texas. Texas A&M Scientist sharing his most recent work with UAV technology. Dr. Muthukumar Bagavathiannan presenting his most recent work with new herbicide tolerant weeds. Over the past couple of weeks I had the opportunity to attend two rice research field days in Eagle Lake and Beaumont, Texas, where rice farmers from all over the state got together to learn about new research being performed by Texas A&M. 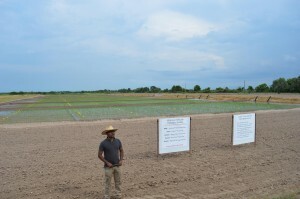 The first field day experience consisted of a tour of the Eagle Lake research farm (where Tabby’s rice experiments are taking place) with stations occupied by the researchers who were presenting their work. Dr. Muthu was one of the presenters who shared about the most recent research that he and Tabby have been working on together. As farmers listened they were able to ask questions and share concerns or ideas that they had. After the tour there was a dinner where a couple of speakers shared the most up to date information concerning international trade and projected market numbers for the American Rice Industry. There was a speaker from Washington D.C. who spoke a bit about the farm bill and potential changes that may be coming due to the 2016 elections. The second speaker was a member of the Texas Rice Growers Association who spoke more about statistics and projected changes in the prices of corn and rice along with concerns about international relations with the rest of the world due to import and export ratios. What struck me most about this field day was the importance of keeping oneself educated and being in the loop when it comes to the latest developments in scientific research. In addition to this, realizing how much everything is connected; from farmers to politicians to consumers and growers in other countries, all affects all. The field day really emphasized the importance of scientific research not only in rice but in the entire agricultural sector as climate and weather patterns are changing along with plant genetic diversity and insect interactions. During the Beaumont research station field day I was able to learn not only about research projects going on at A&M, but I also had the opportunity to listen to a few projects going on in Mississippi State and North Carolina State University. While listening to the different research projects I noticed that one of the leading concepts guiding these projects was the use of water in rice fields. Rice production requires an enormous amount of water which is sometimes a problem in times of drought. Although Texas is among the leading rice producers in the United States, water usage and efficiency are top priorities as scarcity becomes more common. The presenter from Mississippi State spoke about an ongoing project revolving the idea of reducing the amount of water used in rice production and letting the soil dry down to a crack. He is now testing for yield variability and looking for statistically significant differences in yield output. One of the most notable things during both field days was how eager the farmers were to learn and communicate with each other. The business is constantly changing and they depend on extension events such as this one to keep themselves informed of changes coming their way. 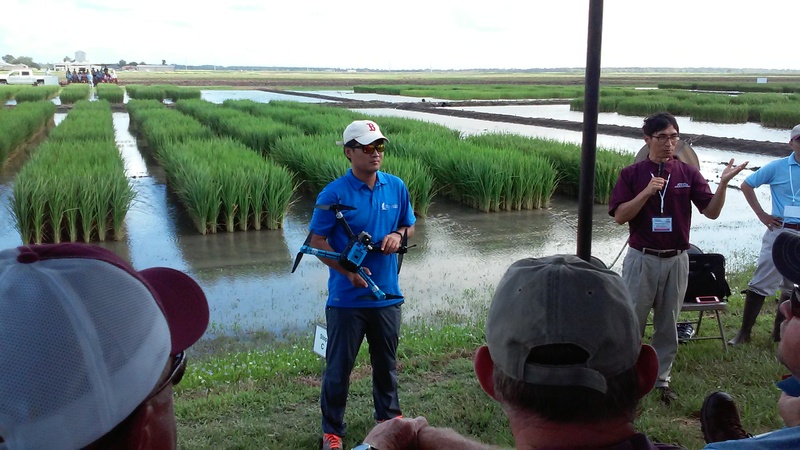 Additionally, events such as the rice field day highlight the importance of interaction between different departments of focus such as entomology, soil and crop, and weed science. Many times there are several problems affecting problems and it requires the help and cooperation of various experts to help them get through a rough season. Extension programs like the AgriLife Research System of Texas A&M provide these research services that can provide farmers with annual information keeping them up to date with the latest news and developments to maximize their field potential. Over the past few weeks here at A&M I have spent most of my time out in the field or in the green house learning from the graduate students that I have spent my time with. 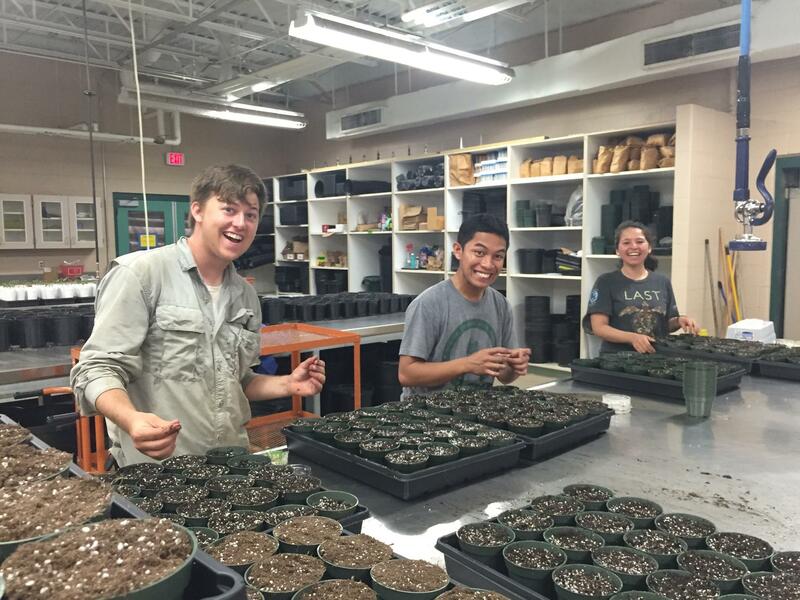 As I mentioned in my first blog, one of these graduate students working with Dr. Muthu is Blake Young who is a first year Masters Student starting his research on Johnsongrass weed control. Johnsongrass is common in the southern portion of the United States and is a significant problem for sorghum producers here in Texas. The object of this study is to find the most efficient way to control for a resistant weed species in a production field. 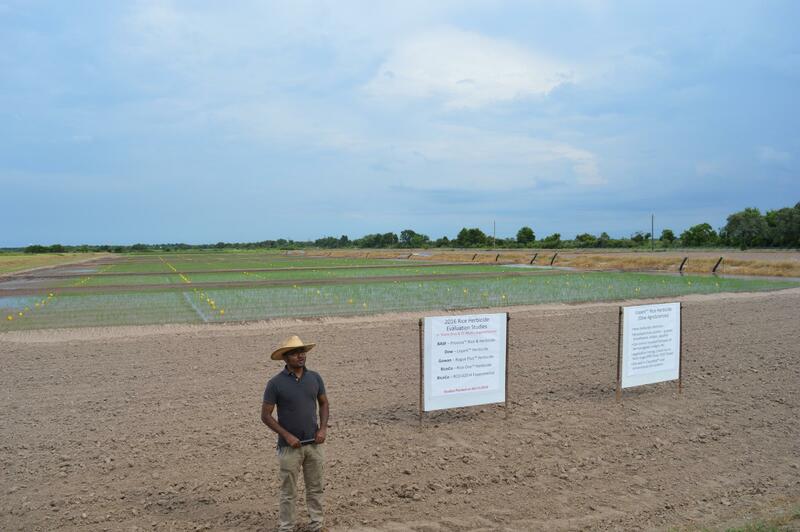 There is not yet resistant Johnsongrass in Texas but within 5 years there is expected to be, so Blake’s project looks forward into the future and finds weed control practices which are not solely dependent on an herbicide. I found this study particularly interesting because it may take an herbicide company as many as ten years (if not more) to release a new product to the market. It takes time to formulate a new chemical compound and it later must pass certain qualifications and restrictions that are imposed by the EPA and other regulation agencies. During this time, resistance in weeds builds up and there come complications when a farmer has no other way to control for these weeds, be it Johnsongrass or any other unwanted flora on his production field. By finding other ways to control weeds it allows farmers to have more options when it comes down to protecting their fields from lower yields. There are also other interesting aspects to this study which I had never worked with before, one of them being the concept of genetic flow between Johnsongrass and sorghum. Because both of these plants are in the same species their genetic information may combine through pollination, and resistance from the sorghum may be passed on to the Johnsongrass weed species. This process however may take years to happen, so for this study an already resistant type of Johnsongrass was introduced. 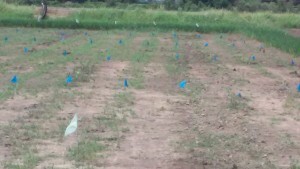 In order to make sure that the Johnsongrass transplants were resistant we tested first for visual signs of resistance. This process took some time as it required the team to grow the Johnson grass seeds in petri dishes to then transplant them into pots and later spray them in a spray chamber to analyze for any possible signs of herbicide damage. There are certain distinctions when it comes to working on an agricultural field for production and working for research. A spray chamber is mostly used to spray a certain number of transplants, but would probably not be used for production purposes. In that situation, a tractor sprayer or a backpack sprayer would be a better option as it can cover a larger area and number of plants in a smaller amount of time. In the weeks to come I will be attending a couple of field days where I will be exposed to other research that Texas A&M University is taking part in and will be in contact with farmers who are interested and impacted by this research. Moving seedlings from the petri dishes to pots in soil. Research requires group effort and cooperation from multiple people. 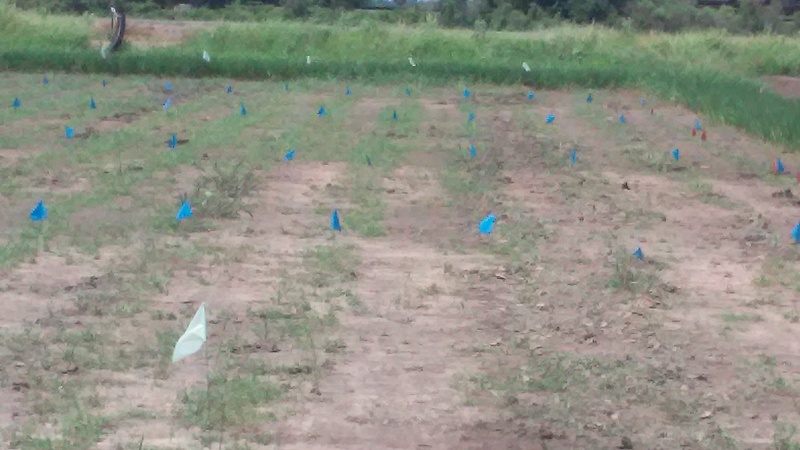 Separating the field by treatment and plot number using bicycle flags. My name is Cynthia Sias and this summer I am engaging in a weed science research lab under the direction of Texas A&M Professor, Dr. Muthu Bagavathiannan (Dr. Muthu). Over the course of nine weeks I will be working with Dr. Muthu’s eight graduate students, each studying a different area of weed science and responsible for several projects. My time here at A&M will mostly be spent with two of his graduate students, Tabby Liu and Blake Young. 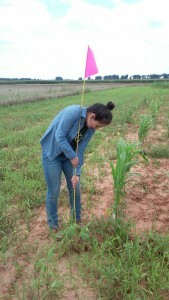 These first couple of weeks I was able to meet the team and began helping with Tabby’s research plots. 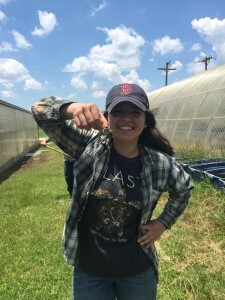 Her biggest project going on for the bulk of her summer is a trial that is being held at the Eagle Lake Rice Research station in Eagle Lake, Texas. This is a common garden study that has four replications focused on differences in growth of 30 different barnyard grass populations that have been collected from 30 different sites all across the state of Texas. This part of the study is going to last about three months including the entirety of the summer, and in the end the 30 different populations will be evaluated to compare for differences in growth and structure. Barnyard grass is a weed that is an annual problem for not only rice producers but also for corn, soybean, and potato producers among many others. Some methods used for suppressing this weed upon germination include cultivation and herbicide use and many times both methods are used together. So far, after transplanting the barnyard grass to a field where rice was planted as protection rows, there is evident differences in germination rates as well as the growth structure that is varying across the different samples. Some samples have shown more horizontal elongation whereas other are more vertically elongated. These different physiologies might have an impact on the way that farmers take action when trying to control for the weed. Another important aspect of this study also surrounds checking these different populations for resistance to commonly used herbicides. Increasing weed resistance to herbicides is becoming an increasing problem, not only for rice producers in Texas, but for farmers in general. If an herbicide is used year after year on the same crop, weeds become immune to it and eventually the herbicide is no longer efficient when controlling for weeds in a production field. A second experiment that is also taking place at the same research center is a smaller study that is centered on understanding emergence rates of the Nealley’s Sprangletop weed which is also becoming an increasing problem for rice producers in Texas. This study involved setting a quadrat in the ground and broadcasting the seed, replicating seven times. 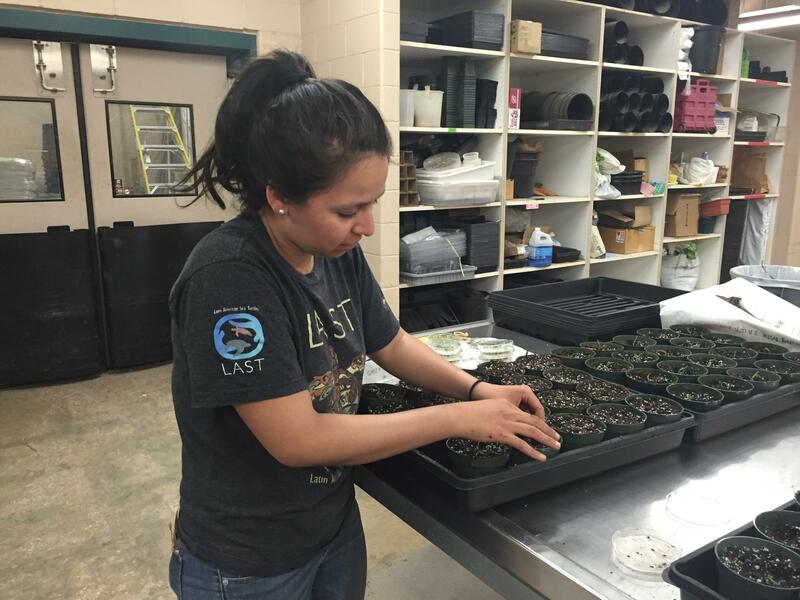 Tabby then returns to the research station every week to check germination rates and growth patterns. The main purpose of this study is to evaluate germination in a controlled environment to evaluate how much of a potential problem Nealley’s Sprangletop may become in future years. Studies like this can provide information about rates of emergence that future generations can expect on a production field as well as potential ways to control for emergence. In addition, soil sampling can provide information about seed beds and their contents found in a rice field. For the next blog I will be sharing what I learned while working with Blake in his Johnson grass trials! Not all the work is performed on the field. While working in the greenhouse I learned about small frogs that like wet and humid environments. There is more to agriculture than just the crops! Tabby’s Rice field of 30 populations of Barn yard grass from 30 different location sites in Texas.